Two weeks ago today my wife gave birth to a little boy – Joel. Since then both of us have been re-prioritizing. 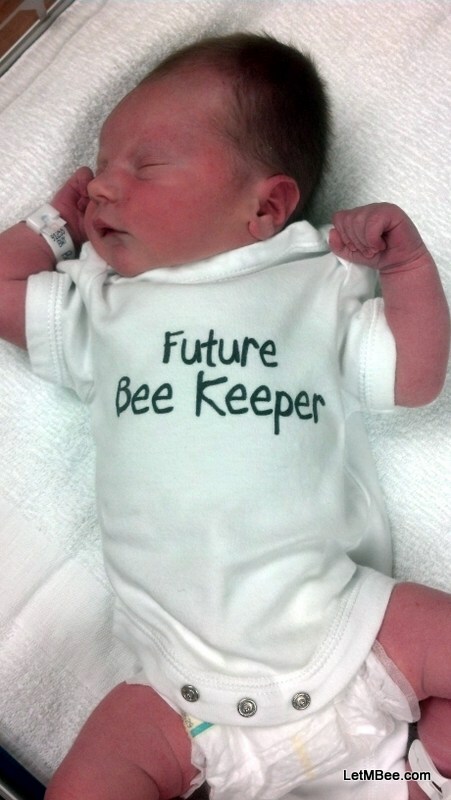 I haven’t lost any passion for beekeeping as his first outfit will show. Our lives have been ruled by the every 2 – 3 hour feedings and diaper changes. It has been a crazy adjustment, but Mom and Joel are doing great. That being said I hope to be back posting very soon. Over the course of the last two weeks I have been able to visit all but two bee yards. My overwintering success this year is not as good as I would have hoped. More on that will be coming soon. This entry was posted in What's going on... Bookmark the permalink. 11 Responses to I’m still alive…. Congratulations to you and Mom! You have been busy posting vids…. Sorry I haven’t been commenting. Truth be told I haven’t had time for much of anything. You do what you’ve got to do and don’t worry about us. 🙂 I understand how it is to be so busy. For me the past couple of weeks have been so busy with swarms and cutouts that I’m finding it difficult to find time to edit the videos. I’m already a few days behind. I wouldn’t be able to keep up with it all if I also had a baby to take care of. How are things looking after winter for you? I have been checking hives, but haven’t had time to write about it. Things looked VERY good about 4 weeks ago, but I have had several losses since then. Several clusters were found dead with members of the cluster showing red and yellow pollen on their legs… Just barely missed out on the next season. Those were the starved colonies. I had other colonies though that died with plenty of honey stores still present. I thinke that varroa took them. Well, spring was a bit disappointing for me, out of the 14 hives I have 4 left, my best hive survived and is super big even this early, its daughter is doing well too. So far it looks like the others starved or simply expired (from being week hives ect) but the biggest culprit seems to be starvation. Last year was pretty bad for flow, also the honey had an unusual taste that I have not encountered before. Ironically my production has not been hurt by the kill off since the only hive I have been getting honey from is doing so well, plus this year its offspring should produce and I am planning on making nucs from both of them. Not all of my hives survived. I have several to add to the Obituaries page. One of the caualties was one of my best hives for the last 2 years. I think they failed early last fall as I found dead long dead drones in there upon Spring inspection. I believe that several hives failed recently as I found several dead bees in the cluster with red and yellow pollen still in the baskets….. That stuff was coming into most hives late March early April. My honey tasted different last year as well. It wasn’t a bad thing. It tasted sweeter than normal. I just got lucky. It was very dry here but the late flow was good for some reason. Hope for a better year AND USE ANY black brood comb with good worker cells from dead hives to bait swarm traps. I cut back to 10-12 traps this year. I got the new youngster and building a house keeping me spread thin. I am used to being busy, but this year my style is being CRIMPED. Good luck and keep all of us posted on what is going on with SAM’S WILD BEES. Congratulations! Handsome boy! I thought thats what was going on, wish you all well and see ya soon. Will do. I am not yet back in the saddle with my time management. I am taking a lot of pictures of what I am up to. Now just finding the time to write about it again. All of the Spring inspections are over and pictures were taken. I used to go to bed early then wake up early to generate posts. Now there is no such thing as a bedtime. Once everyone gets on a schedule again be looking for new content. Sorry I didn’t make it to the last meeting. My schedule is BONKERS lately. I heard that Tim Ives was discussed. Don’t know if you are on facebook or not but he is on there…. Send him a friend request and he will accept. I don’t know how he has time, but he is nice enough to answers questions for me when I ask. He has a lot more going on than just using 3 deeps for the brood chamber. The guy knows his bees. He told me he is supposed to be speaking at a Central Indiana Beekeeping Assn. meeting sometime this summer. He isn’t sure when that is going to be yet…. I can let you know if you are interested.